Are you feeling jaded with your old appearance? Try the new beauty mantra for a change. Fret not if you haven’t been keeping up with the beauty trends. Here are some looks for the new year, from make-up to hairstyles, inspired by the Spring/ Summer 2017 fashion shows. 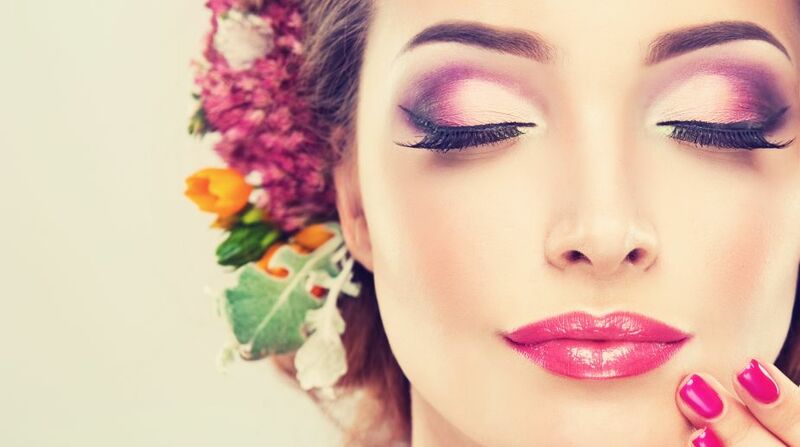 Instead of wearing striking coloured clothes or accessories, try making a bold statement with your make-up. The look is popular on the runways, with neon yellow eyebrows and electric blue eyeliner as examples. They may be too adventurous for some, but you can stick to one special touch for a simpler look. Famous make-up artist Pat McGrath said in Allure, It is all about one bold element on clean skin. Looks like the glitter you used for your artwork in school can be used on your lips as well. Fashion houses Fendi and DKNY worked the glitter on the lips of their models this season, elevating their looks from normal to fun. Just try not to eat or drink while having all that sparkle on your lips. Skip the cut crease eye shadows, strong liner for a cat eye and heavy contour – opt for a more natural look this year. Vogue and Elle included the natural look in their list of beauty trends for next year as it was all the rage on the runways – brands such as Tommy Hilfiger and Proenza Schouler used make-up to only cover up blemishes. Singer Alicia Keys is a huge advocate of this look, while Kim Kardashian has tried it out. Bonus: This trend can help you save on make-up products. When highlighting became popular, everyone started slapping on the shimmer to accentuate the highest points of their faces. The natural look is now in – it is time to swap the shimmer for something more toned down for a light and dewy look. This is probably the easiest eye shadow look to achieve, and it can be worked into every look. Simply use a black eyeliner pencil around your eyes and smudge it. Balmain and Altuzarra recently showcased this look on their runways. Its also appearing in Harpers Bazaars beauty trends list. Make-up artist Tom Pecheux told the magazine, Grease on grease is the perfect recipe for this look. Who knew that the look modelled after sleeping in your make-up could be so trendy? Think sophistication and clean lines when trying this look. The deep side part pairs well with all hairstyles, including a low ponytail. Hairstylist Anthony Turner said backstage at the Salvatore Ferragamo show to Allure, A middle part is pretty, but a low side part makes you look like you mean business. Braids are making a comeback on the runways, with Roberto Cavalli and Valentino incorporating them into the looks for their models, but with a twist to avoid them looking too young. No matter, if you want to look romantic or rocker chic, braids are the way to go. Take the bright pink blusher to the next level by applying it to the temples of your face, rather than the apples of your cheeks. This interesting style, which was seen in looks by Topshop Unique and Chanel, gives a nod to retro make-up looks. If you want to work it into an everyday routine, blend the blush from the cheeks to the temples. But beware – you do not want to be end up looking like Marie Antoinette! Vogue cited the ears as an upcoming beauty focus point. They were given the centre stage during Giambas fashion show, where the tops of the models ears were painted with silver glitter. At Bottega Veneta, the hair was clipped back to show them off. Take the opportunity to show off your ears – and earrings. The most common look on the runways is a bright red or pink lip, both matte or glossy. Say goodbye to nudes as a brighter tone is sure to make your look pop. For a more dramatic look, try going for an ombre lip by mixing your red and bright pink lipsticks and glosses.